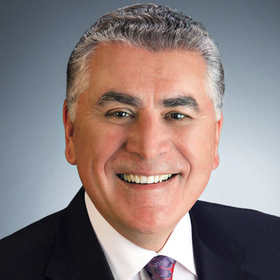 Richard Cordova still expresses some surprise about the somewhat random series of events that led him to his long career in the healthcare industry, one that was highlighted by a nearly 10-year stint as CEO of Children's Hospital Los Angeles. It was just after completing his undergraduate studies at California State University in 1972 that Cordova participated in a management trainee program for Los Angeles County, where his first assignment just happened to be reviewing public hospital budgets. “As I toured the hospitals and became friends with many of the administrators, it just caught me—this is what I wanted to do,” Cordova said. From there Cordova never looked back. He spent nearly 25 years in leadership roles at public hospitals in both Los Angeles and San Francisco counties before switching to the private health sector. In 1998, Cordova joined Kaiser Permanente as senior vice president of the system's Southern California Division, and was eventually named Kaiser's Southern California regional president in 2002. But Cordova said it was his time leading Children's Hospital from 2006 until his retirement in 2015 that left the most lasting impression on him. “There is nothing more invigorating and fulfilling than treating children,” he said. This year Cordova is the recipient of the Gold Medal Award by the American College of Healthcare Executives, the organization's highest honor to recognize individuals who exemplify leadership and make an impact on health beyond the confines of their own organization. Part of that impact has been seen in Cordova's effort throughout his career to promote greater diversity within healthcare's C-suite. He is a founding member and first chair of the National Forum for Latino Healthcare Executives, and is a past chair of what is now called the Institute for Diversity and Health Equity, an American Hospital Association affiliate. Cordova felt such efforts were all a part of his leadership approach, which he said favored collaboration and promoted an organizational culture that promoted success even through adverse situations. Cordova's time as head of Children's Hospital L.A. was marked as a period of great expansion for the organization. He ran the effort for the hospital's first $1 billion fundraising campaign, which went toward building a 365-bed facility that opened in 2011. “If there was a pinnacle in my career, that was it,” Cordova said. He also oversaw creation of the hospital's Children's Vision Center in 2007 and in 2009 expanded the hospital's research arm to create its Center for Personalized Medicine to further research in fields such as genomics and molecular microbiology. Since his retirement, Cordova has continued working to develop the next generation of healthcare leaders. He is currently a senior partner with the consulting firm Strategy Advantage, where he works part time to mentor young talented individuals to become healthcare executives; he also sits on the board of several organizations.